Welcome to Motocross-ATV.com, the only online motocross store you will ever need for the best motocross gear, parts, apparel and accessories. Competitive prices, ultimate selection and latest styles of ATV gear, moto gear and dirt bike gear. Parts for ATVs, quads and dirt bikes, the latest styles of ATV, dirt bike and motocross apparel and accessories. Our friendly staff is knowledgeable and always ready to help, feel free to contact us by phone or email. If you are looking for a particular brand like Troy Lee Designs, Fox Racing, Alpinestars, One Industries, Answer, Thor, Shift, Dubach, Sunline, Pro Circuit and more, shop for the top brand names of ATV, dirt bike gear, parts, apparel and accessories. Whether you need a durable Leatt Brace, new pair of premium motocross boots, MX racing combo set, dirt bike engine parts, body parts, exhaust systems, we have them! Please explore Motocross-ATV.com for informative articles, product news, moto guide, latest styles of motocross gear or closeout prices on top performing gear and more. Top Brand Names at Motocross & ATV include - Acerbis, Alpinestars, Ancra, Answer Racing, Arai, Asterisk, Cycra, Dragon, Dubach Racing, Fly Racing, FMF, Fox, Fox Racing, Gaerne, Go Pro, Hinson, Leatt Brace, Moose Racing, Motion Pro, Motorsport Products, No Fear, Oakley, Ogio, One Industries, Powertye, Pro Circuit, Pro Taper, R&D Racing, Ratio Rite, Renthal, Scott, Shift, Shock Doctor, Shoei, SiDi, Sixsixone, Sunline, Tag Metals, Talon, Thor, Troy Lee Designs, Twin Air, Warp 9, Works Connection and Yoshimura. Shopping our online motocross store is fast and easy. Check out our entire inventory of motocross gear, shop for dirt bike boots, helmets, gloves, goggles, protective gear, jerseys, pants, combos, ATV and dirt bike parts, accessories, MX gear closeout specials. *FREE Shipping for continental USA on purchases over $89.00. International Shipping - Free shipping for orders over $799.00 U.S. Dollars - shipping method choices & low cost shipping rates offered during checkout, prior to payment, for all other orders. Questions - see Help/FAQS - contact us by phone, email or come on in. We are located in Southern California. 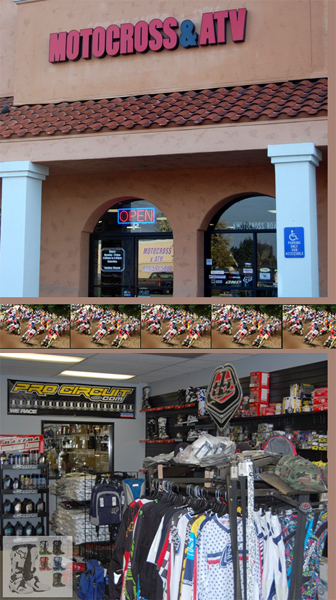 If you live in the area visit our store Motocross & ATV in Chino, California for best selection of ATV Gear, Dirt Bike Gear, Parts, Accessories, Apparel and Motocross Gear in Chino, near Los Angeles, San Bernardino, Riverside and Orange County. Sign up for our mailing list to receive specials and motocross gear sale notices.